Her biography starts with traditional details, such as her date of birth in her native country of Slovenia and information about her background as a model. That’s when the brief backgrounder takes a promotional turn. The website includes a lengthy list of brands that hired her as a model and several of the magazines in which she appeared, including the Sports Illustrated Swimsuit Issue. It is not uncommon for the White House to note the accomplishments of the first lady in her official biography, but Trump’s decision to include a detailed list of her media appearances and branded retail goods is unusual. Early on Friday, the website listed the brand names of Trump’s jewelry lines sold on QVC. But the website was updated after the publication of this story to remove any mention of QVC. The original passage read: “Melania is also a successful entrepreneur. In April 2010, Melania Trump launched her own jewelry collection, ‘Melania™ Timepieces & Jewelry,’ on QVC,” the site read. The televised sales company does not currently sell Trump’s jewelry, according to a statement from a QVC spokeswoman. The changes come at a time when questions have been raised by critics about the ethical implications of the family’s business entanglements. A spokesperson for the First Lady said the reference to her jewelry line was intended as a factual statement, not an endorsement and the website was updated out of an abundance of caution. President Trump has been criticized for failing to fully sever ties with his famous business empire. He announced this month that he would turn over control of his businesses to his two adult sons, but critics say he has not gone far enough. 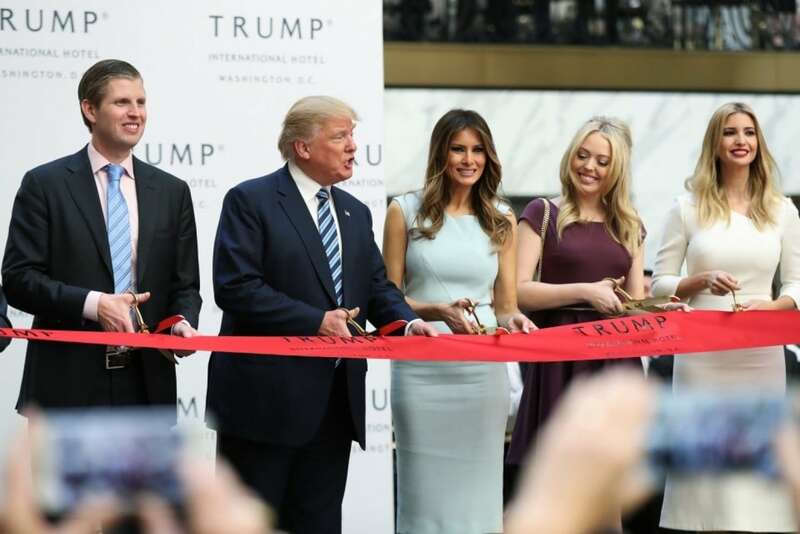 The watchdog group Citizens for Responsibility and Ethics in Washington tweeted Friday that Trump is in violation of the emoluments clause in the Constitution, which bars elected officials from profiting from the office they hold. The site also touches on the previously controversial subject of Melania Trump’s university background. “She would pursue a degree at the University of Ljubljana in Slovenia, but pause her studies to advance her modeling career in Milan and Paris before moving to New York in 1996,” the site reads. Melania Trump’s college education was a sensitive point during the campaign. A biography of Trump distributed in a program at the Republican National Convention, which mimicked her biography posted on the Trump Organization, had indicated she had begun modeling “after obtaining a degree in design and architecture at university in Slovenia.” Reporters then learned that she had attended the university but did not graduate, prompting the Trump Organization to remove her biography from the company website altogether.